Information gathering phase. Research client offering(s) market and competative landscape. 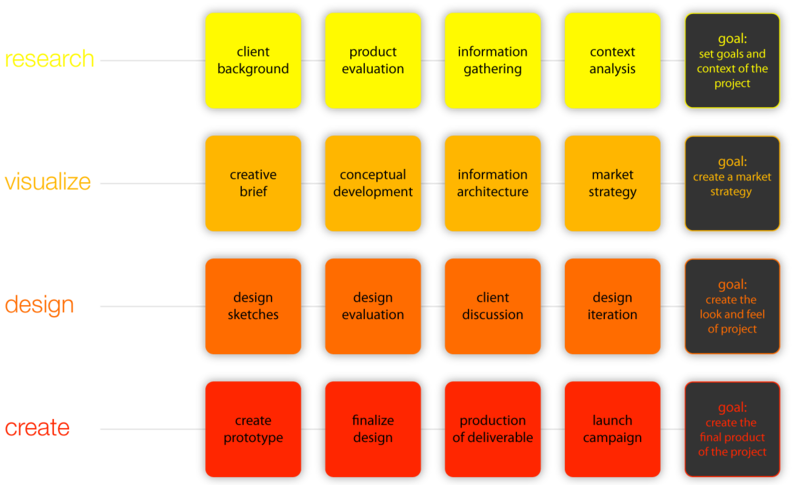 Analysis of goals and objectives of client offering(s) to deliver design and content in an effective campaign. Critical thinking phase. Develop conceptual strategy and approach using analysis and conclusions of data gathered. Conceptualize visual presentation methods based upon strengths of client offering(s). Articulation phase. Create the visual architecture of the conceptual approach. Explore / develop color, type treatment, look and feel of the design. Present comps and sketches for client review and discussion. Production phase. Designs created in final format for print production and / or media outputs, online integration or media presentation as needed. Production and delivery of deliverables. Clear communication is the key to strong results for each project. Our approach begins with an initial discussion about the design project. We get an in-depth look at the current situation; your story, your approach, who you are trying to reach and the key goals involved. Then we take a look at the larger picture or context. This forms the foundation upon which we vizualize, explore new directions, and contextualize approaches for achieving the goals of the project. The strongest concepts are brought into focus and sketches are presented. Designs are discussed and developed and honed into the final version through an iterative process. The project is completed with the creation of the final deliverable. Turn around time is subject to a number of factors. Four Design will create sketches for each design round within 72 hours or less. The client’s ability to review and discuss sketches and design rounds influences the speed with which a project is completed. Four Design works with print production teams. Four Design provides oversight of the print process including proof approvals, press checks and production interfacing. Four Design is commited to creating visually exciting and environmentally responsible solutions for printing. Where possible, environmentally friendly printing options will be presented to the client.